Squares are the most common shape in patchwork blocks. If a block includes a large center square, consider replacing it with a border print square made from four identical triangles. Or, rather than alternating pieced blocks with plain ones, use border print squares for the alternate blocks for lots of impact with very little sewing! Download Border Print Squares Made Easy for future reference. Determine the finished size of the square needed. Divide the square diagonally from corner to corner to create four triangles as in the diagram, right. Make a template from one of the triangles from see-through template material. Be sure to add a ¼-inch seam allowance around all sides of the piece. Draw a line down the middle of the template as shown, to use as a mirror line. Make a template by tracing around one of the triangles, then drawing 1/4″ outside those lines. Using the mirror line as a guide, center the template on one of the motifs in the border print fabric, making sure that a line from the border print falls just inside the sewing line on the long side of the triangle template. (This ensures that you will have a nice line or frame around the outside of the finished square.) Mark some portion of the design directly onto the template to use as a guide for cutting the remaining pieces. Carefully draw around the template and cut the piece out. If you want to see what the square will look like before actually cutting the pieces, position the template onto the fabric, then place two mirrors on the two short sides of the triangle so they meet at a right angle. Carefully remove the template to see what the finished square will look like. Center the mirror line on the fabric motif and draw a portion of the fabric design onto the template. Cut three more triangles identical to the first, then sew them together to complete the square. Placing your triangle on different portions of the border print will produce different effects! 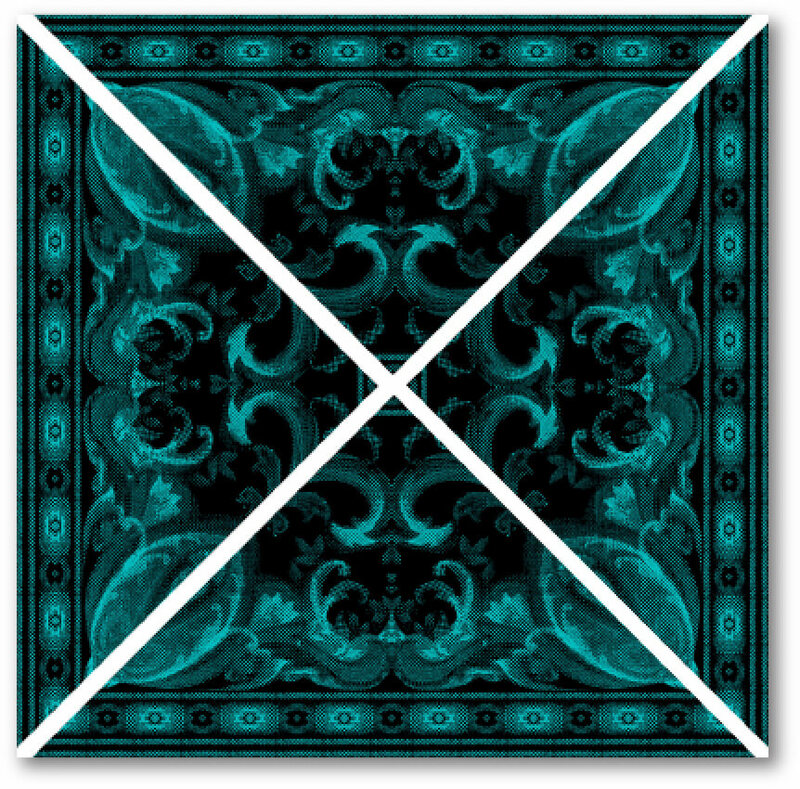 Four identical triangles sew together into a gorgeous border print square. Simply changing the position of the template on the fabric creates a host of designs.